It would be true progress to never again hear the phrase, “OK ... but” — two words that are at the start of so many sentences addressed to women who dare to state their opinion or stake their claim in the world. Sometimes I wonder if we’ve learned anything from the November election. 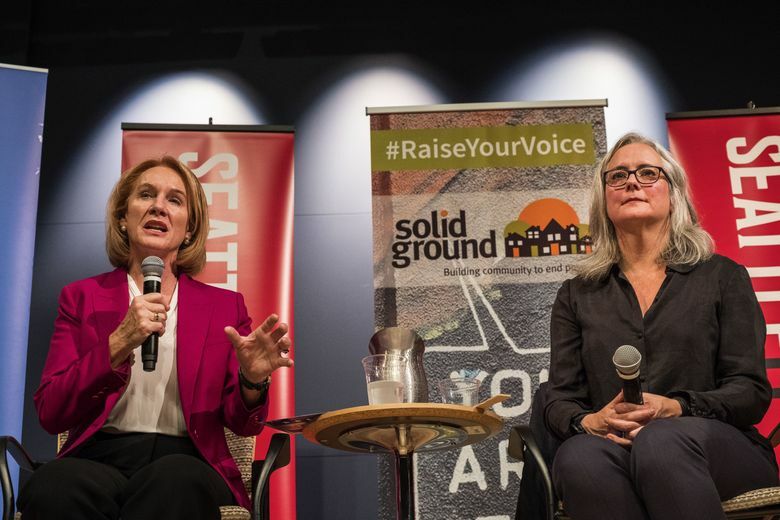 On the morning after the Seattle mayoral debate between Jenny Durkan and Cary Moon, online commenters showed that it is still impossible for a female candidate to be taken seriously. No matter her credentials, her preparation or her desire to take on the hardest job in the city. Another Redditor graciously obliged, posting Durkan’s résumé, which spans decades, involves every level of government and touches on issues like police reform, consumer privacy and civil rights. The thing’s as long as your arm, and has plenty of muscle, political and otherwise. There you have it: voters who are not willing to put the time or keystrokes into learning the basics on the candidates. And even when they do, they’re only focused on their pet issues. It would be true progress to never again hear the phrase, “OK … but” — two words that are at the start of so many sentences addressed to women who dare to state their opinion or stake their claim in the world. OK … but you have kids. OK … but your husband has a big job. OK … but we’ve never had a woman president/CEO/mechanic/lawyer/window-washer/fill in the blank. The only job a woman might not be qualified for is sperm donor. Beyond that, we should be able to have our shot, just like any man who decides to toss his hat into the ring — some of whom act as if elected office were a round of golf. Ahem. But this is what happens when women run for office. They are forced to face impossible standards about their appearance, their qualifications, their temperaments. Too prepared, and they’re wooden and rehearsed. Too tough, and they’re cold. The struggle isn’t limited to national office. Tracy Flick almost lost her mind in “Election” when the dim jock broke his leg and, what the hell, decided to run against her for class president. It was understandably — and hilariously — maddening. This higher standard has kept a lot of qualified, capable women from entering politics at all. Of the 1,362 mayors of U.S. cities with populations over 30,000 people, only 283 — 20.8 percent — were women, as of earlier this year, according to the U.S. Conference of Mayors. Of the country’s 50 governors, only six are women, as are only seven of 50 attorneys general and 13 of the 50 secretaries of state. That’s 26 out of 150 offices — about 17 percent. “Underneath, people don’t believe men and women start from the same place, or that they ought to then keep moving to the same places,” said Rebecca Sive, author of the 2013 book “Every Day is Election Day: A Woman’s Guide to Winning Any Office, from the PTA to the White House” and a lecturer at the University of Chicago’s Harris School of Public Policy. It’s been shown over and over, Sive said, with the November presidential election being the “emblematic” example. Seattle voters don’t have any choice but to embrace the reality that — unless a male write-in candidate can perform political miracles — we will have a woman mayor in January. This election gives us a rare opportunity to see Durkan and Moon as candidates, first and foremost. So we should treat them as such, and not nitpick over every gesture, every hair out of place, every time they didn’t smile like a swoony hostess at a garden party. These women mean business. The future of our city is at stake, and they know it. Maybe the decision shouldn’t be whether we want to vote for them, but whether they want to represent us.